Alternating details . . . Shortened daylight hours are followed by autumnal hues. In our homes these changes, along with a crispness in the air, signal a time of transition. Time to break from lightweight bed linens to those with a bit more warmth naturally built-in. From a summer weight comforter to our winter weight Duple Silk comforter or possibly our Southern Light or Mountain Air white goose down comforter. Our fine linen designers have introduced a combination of the freshest colors with some of the finest yarns and weaves to make your bedrooms inviting and oh-so-warm and soothing. From France, Italy, Switzerland, Belgium, the U.S.A. and beyond. Many hands work together to make a detailed bed. Our fine linen designers create the perfect companions to DEWOOLFSON's expertly filled and stitched down and silk fillers. Curious to learn more about any of the linens you see on the following pages? 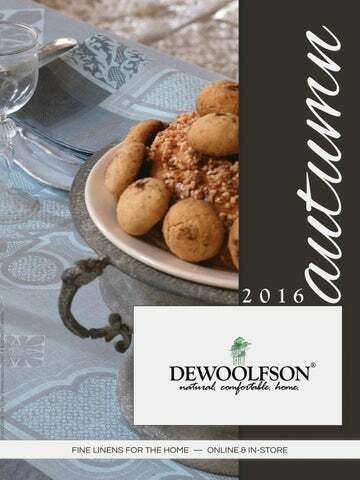 Click on most any image and you will be taken to that page on our merchant website - dewoolfsonlinens.com. We hope you find this look book to be a warm invitation into the world of fine linens.